On TV, Kyle MacLachlan battles desperate housewives. In real life, he has joined forces with one of Washington state's top wine talents to make Cabernet. Actors are usually good at being guests, not hosts, but Kyle MacLachlan could be a cruise director. As he leads me and a caravan of friends and family around Walla Walla, Washington, for two days—before having us over to a dinner party he’s hosting at a local bar—his energy doesn’t flag once. He maintains a hyper-vigilance over all our needs: When he’s not pointing out sights, he’s calling ahead to make sure things are set up for us. I don’t think my parents asked this often if I had to go to the bathroom. Photo © Cedric Angeles. I discover MacLachlan’s hosting talent soon after I get off the morning flight to Walla Walla, the heart of Washington-state winemaking; he comes here to work on his Cabernet blend, Pursued by Bear. MacLachlan—who must follow plane arrival times pretty closely—calls my cell, worrying that I need coffee. So I walk a few blocks and find the smiling, perfect-haired actor at the Walla Walla Roastery. He introduces me to the Russian Orthodox owner and insists I try the baklava from the local nunnery. I’m amused that the guy who played the coffee-obsessed FBI agent on Twin Peaks knows a coffee-bar owner so well. This is before I realize that MacLachlan knows everyone in this town well. But maybe it’s not hard to know everyone when there aren’t many people around. Walla Walla itself isn’t very big, and the surrounding area seems like an endless expanse of wheat fields. Yet scattered amid those wheat fields are vineyards producing great Cabernets and Syrahs—neither as pumped up as many California reds nor as funky as some French ones. And thanks to the wine industry, the restaurants, wine-tasting rooms and hotels have started to open up, so that Walla Walla is lately looking like a mellow version of Healdsburg in Sonoma County. Over coffee, MacLachlan tells me that he got into wine while growing up in Washington state, since he didn’t like beer. "But in high school, you have to drink something," he says. His high school girlfriend’s parents served wine at dinner, and soon he talked her older sister into buying him cheap whites for picnics. Then, after MacLachlan was cast in Dune in his early 20s, director David Lynch discovered that there was a Bordeaux château named Lynch-Bages, and he and MacLachlan began trading bottles. When MacLachlan wanted a home-state wine for his wedding to Desiree Gruber in Miami in 2002, he came across Dunham Cellars, one of the best producers in Washington, and liked its laid-back winemaker, Eric Dunham, so much that he invited him to his wedding reception. Dunham—not, apparently, a close reader—missed the "black tie" part on the invitation. But he had a great time: "I got to see Frederique Van Der Wal and Naomi Campbell salsa dance with each other," he recalls. Shortly after that, MacLachlan was looking for an excuse to spend more time with his dad, Kent, who lives in Yakima, Washington. 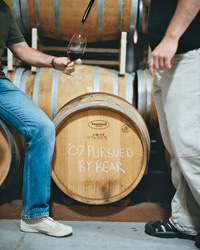 He decided to launch Pursued by Bear, a very good, small-production Cabernet Sauvignon made at Dunham Cellars. It’s named after a goofy Shakespeare stage direction; there’s no reference to MacLachlan or his career on the label at all. It’s the polar opposite of a vanity project. Photo © Cedric Angeles. Coffeed and baklavaed up, we drive a few miles to the Snake River. Dunham’s houseboat is moored there—Walla Walla seems to be the kind of place where winemakers randomly own things like houseboats—and soon, MacLachlan is diving into the water from the upper deck, trying to fight the 100-degree heat. He then cools down even more by opening a chilled bottle of Dunham Cellars Lewis Estate Vineyard Riesling. Coming here, he says, is the best part of making wine. "When you start out, you romanticize being in the wine business, the lifestyle," he says. "Now I’m becoming more of a salesman then I ever thought I’d be." 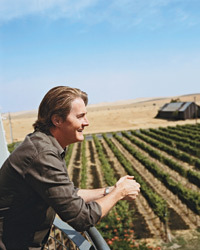 That night, MacLachlan hosts a dinner at Dunham Cellars. A lot of wine is poured. So much that one of the guests decides she’s going to marry her boyfriend. Right now. So she proposes to him, then asks MacLachlan to give her away. She asks another guy, who’d said he was a minister but now seems to be wavering, to perform the ceremony. Photo © Cedric Angeles. The next day, MacLachlan and I meet up with his dad, Kent, a stout, sunglassed, blunt old golfer who is both obviously proud of his son and unlikely to let him get away with anything. We head off to meet Dunham at a farmstead cheese producer, Monteillet Fromagerie. It’s the home of Pierre-Louis Monteillet and his wife, Joan, who gave up 15 years of wheat farming to start making great cheese a few years ago. MacLachlan donated an old 34-foot Airstream trailer he’d used on sets to the farm, and now several interns sleep there. As the interns drink Dunham’s wine, we sit on the steps of their sauna house over the river and eat ice cream: an idyllic scene. We arrive early for MacLachlan’s dinner party at the Jimgermanbar in nearby Waitsburg. Jim German, the owner, is a painter and former Seattle mixologist. The bar looks like it’s been dropped in from New York but somehow retained the building’s original Northwest attitude, with high ceilings and the original fir and pine. German has stocked the place with a huge list of obscure spirits and fresh ingredients to make cocktails, and also serves "Etruscan snacks," which include our appetizers for the evening: a rich dip of white-bean puree with herb pesto and house-cured chorizo slices poached in red wine, with just enough spice to keep people from putting down their cocktails. Photo © Cedric Angeles. In the private dining room next to the bar, Chris Ainsworth, the chef-owner at MacLachlan’s favorite Walla Walla restaurant, Saffron Mediterranean Kitchen, grabs an enormous two-handled pan off the wall that I’d thought was for decoration. Ainsworth, formerly of Seattle’s Fish Club, moved here for the same reason that nearly everyone else I’ve met has: to be able to run his own joint. He heads out back to the grill on the patio, where he starts to make a paella-like dish made with fideos (thin noodles) instead of rice. Along with a lot of saffron, Ainsworth dumps in a bucket’s worth of Mozambique prawns, easily the largest anyone at the dinner has ever seen. By the time the mesclun salad with blue cheese and fried shallots comes around, most people have gone out back for a second serving of fideos. They have also poured themselves enough Pursued by Bear Cabernet and Dunham Syrah that Amrah Neal, a young barista from the Roastery, can finally tell Dunham and MacLachlan how disgusted she is that they put sugar in their cappuccinos. And Joan, the cheese lady, who has few inhibitions to begin with, comments on the cuteness of the male guests. And the male waitstaff. And males who are not even there. Pleased with all the artists, winemakers and food artisans at the party, she says, happily and loudly, "I’ve waited my whole goddamn life for this town to change." And even though I know he’s just an occasional visitor, it feels like MacLachlan made it happen, just by bringing them all together. Joel Stein, a columnist for Time magazine, is at work on a book entitled Man Up for Grand Central Publishing. 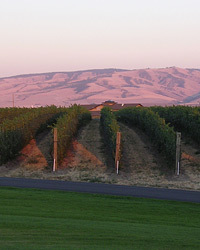 Washington is the ____ largest wine producer in the U.S.
1. Which grape is Washington best known for? 2. 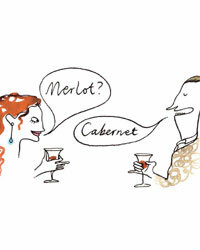 Which is not an appellation in Washington?